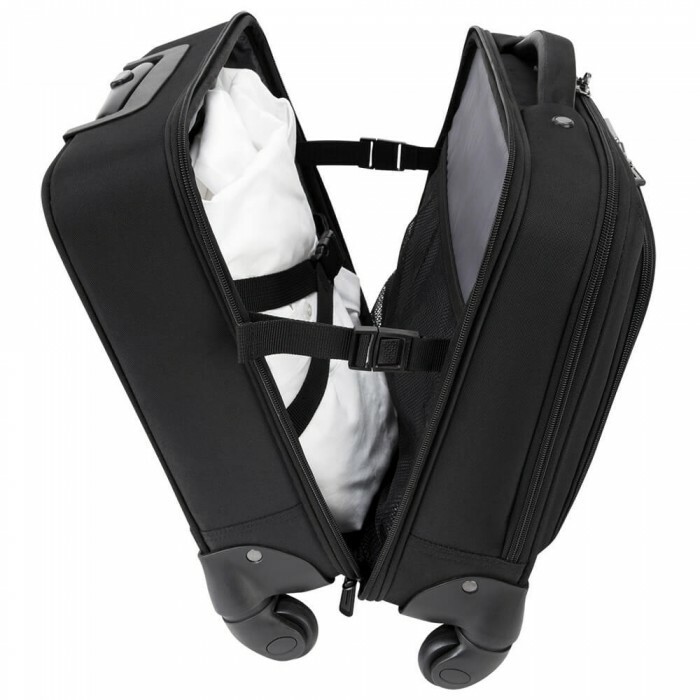 The 15.6” Mobile ViP 4-Wheeled Business & Overnight Roller offers plenty of storage, from the dedicated overnighter section for apparel to its separate, padded laptop and business compartment. Made for effortless travel, with four durable spinner wheels that roll in any direction, lockable zipper pulls for enhanced security, and restraining straps that prop open the overnight section so that you can grab and go without opening the entire bag. 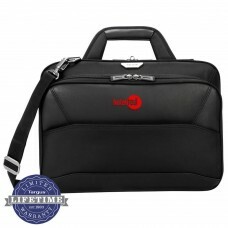 separate, dedicated section just for your laptop, files, and accessories. 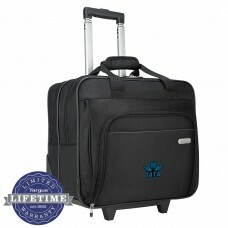 Strategically located pockets, workstation, and dividers ensure you can easily find what you’re looking for. The design is finished with leatherette and visible stitching for a tailored, professional look. A zip-down organizer and dividers make it easy to keep track of your docs and small devices. The front provides quick access to small items, and a hideaway pocket is a great place to stash a water bottle or umbrella. This ingenious overnighter includes two distinct compartments—one for your slacks and button downs, and the other for your laptop and business docs. 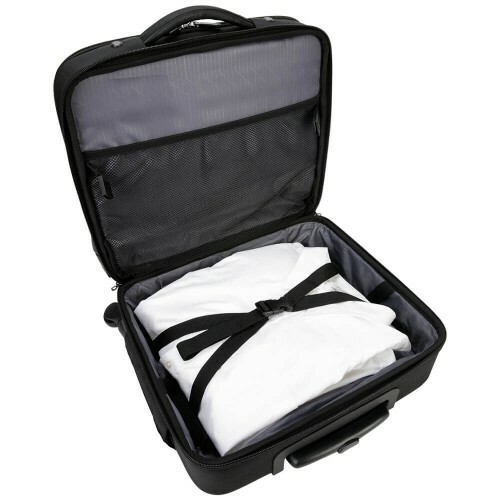 Restraining straps allow you to access the overnight section without opening the entire bag, so that it moves easily from airport to taxi to hotel. There’s even a hideaway pocket on the side for a water bottle or your travel accessories. 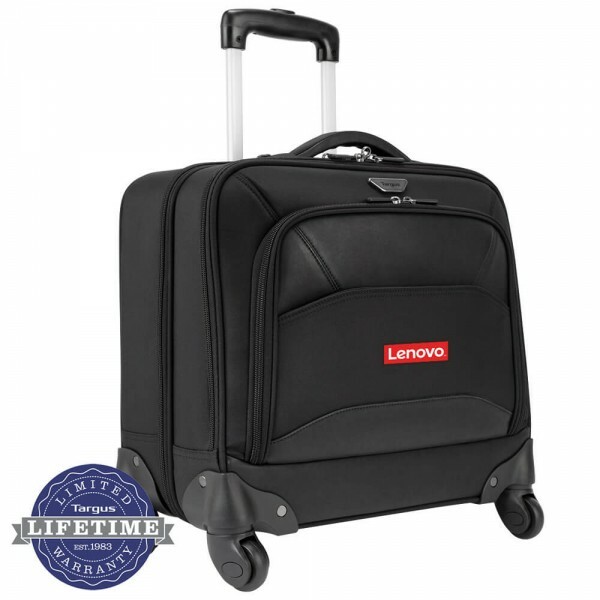 4 durable spinner wheels roll in any direction to make for effortless travel. 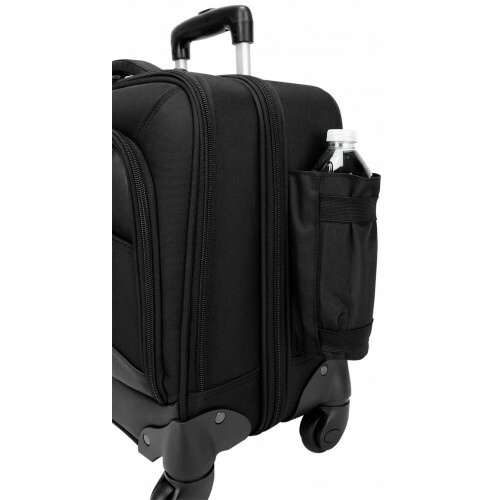 Easy access 3-stage trolley handle extends for easy travel and retracts when it’s not in use. Fits tablets up to 12”. Size: 16 15/16W" x 16 1/8H" x 7 1/2D"